Opening times Mon–Tue noon–6.30pm; Wed–Fri 10am–6.30pm; Sat/Sun 10am–5pm. Food served Mon/Tue 12pm–6pm; Wed–Fri 10am–6pm; Sat–Sun 10am–5pm. Set up by Poppy Murricane in 2016, Rawnchy specialises in handmade free-from desserts. With a focus on healthy living and enviromental friendliness, Rawnchy’s raw vegan products – including cakes, tarts and bars – are all free from dairy, gluten, soya and refined sugar. The plant-based desserts use no artificial colourings or flavourings. The eye-catching, colourful puds can be found in Rawnchy's own café at St Georges Cross and in various cafés, restaurants and delis around Glasgow and beyond, or order from their website. The Rawnchy café now offers a small savoury menu including a soup bowl, hummus bowl and antipasti nibble board - all vegan and gluten free. 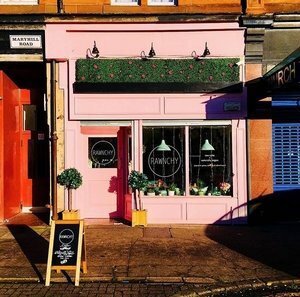 A pastel hideaway on Maryhill Road, Rawnchy is Glasgow’s first raw vegan dessert café. Inside, you will find something like a dairy-free fairyland that is charming without being overly chintzy. Garnished with flowers and other dainty touches, many of the treats on display delight the eye as much as the taste buds. The cheesecake-style strawberry and pistachio slice is topped with a fluffy, zesty mousse that contrasts nicely with its salty nut base. The ‘vegan twix’ is a rich, gooey little indulgence with natural sweeteners that make it healthier than its famous namesake. As well as your usual selection of caffeine fixes, the range of coffee-free lattes — including lavender, rose and matcha — are so dreamy that they could put Columbian beans right out of business. Although desserts are the definite focus here, a new savoury menu of soups, breads and nibbles has just been launched as well.